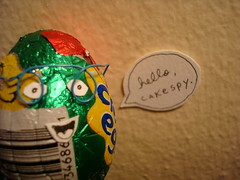 Cakespy: How are you today? 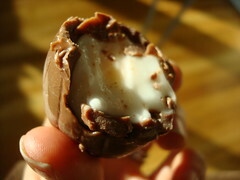 Cadbury Creme Egg: It's a sweet day indeed! Easter is approaching and business is booming! An estimated 300 million of my brethren will be produced and devoured this year. CS: Err...yes. Well, can you tell us a little bit about how you came to be? CCE: It was a long and winding road. It all started in 1875, when the Cadbury brothers introduced their first chocolate Easter eggs--my first known ancestors. They were solid chocolate and far different from the creme eggs of today. In 1923 the recipe further evolved with the addition of whipped fondant; through the years experiments were made with marzipan eggs and different recipes, but it it was ultimately me, the soft and gooey fondant egg, that was perfected in 1971 and has been breaking hearts and melting in mouths ever since. CS: And how is it that you are made? CCE: Well, it all starts in a half-egg shaped mold, which is then filled with solid white fondant and a dab of yellow fondant to simulate the yolk. The two halves are joined very quickly and then immediately cooled to allow the chocolate to set. The fondant filling, while solid while the eggs are made, is then injected with an enzyme which causes it to liquefy into the gooey substance found in the finished product. The finished eggs fall onto a conveyor belt which transports them to the foiling machines and then to the packing and shipping area. CS: That enzyme thing is kind of gross. CCE: I won't deny that. But does it make you want to eat me any less? CS: You originally hail from the UK, but you're all the rage here in America too. Can you tell us a bit about how American Creme Eggs differ from the European counterparts? CCE: We're bigger in the UK. I mean, literally. Hershey, the US producer of Cadbury Creme Eggs, elected to make us smaller in the US. This was kind of a scandal for a while, what with the initial response from the Cadbury spokespeople that "No we haven't shrunk you've just grown up!" 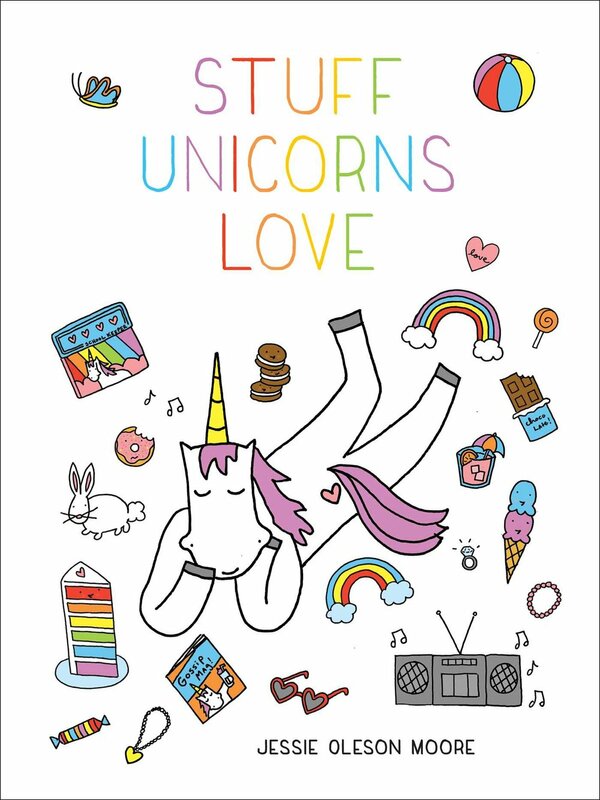 --but yes, it's true. But truly, even if we're a bit smaller in your hand, we're just as big in your heart. Nonetheless, if you want the bigger one, just go over to Canada--the "full-size" ones are available there. 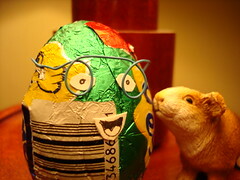 CS: Who came first, you or the mini (candy-coated) egg? 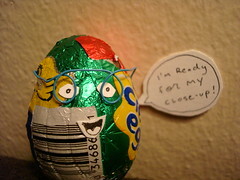 CCE: Well, the mini eggs were introduced in 1967. While I wasn't released in my current form til 1971, I had been a work in progress since before the turn of the century. 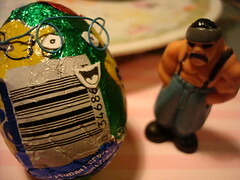 CS: Is there any rivalry between you and the mini egg? CCE: Those little *$%#@s? No, none at all. Why would there be? (Stares stonily). CS: OK, Moving on. Why is it that your innards are made color-appropriate to a real egg, but we have to suspend our disbelief with the color of your shell? CCE: (Blinks uncomprehendingly for several moments) Well, smartypants, perhaps you should suspend this interview with me and instead interview my cousin, the Cadbury Dream Egg (white chocolate shell with white chocolate fondant filling)? CS: How many different variations on the Creme Egg are there in the Cadbury family? Orange Creme Eggs (Creme Eggs with a hint of orange flavor), Mint Creme Eggs (green "yolk" and mint flavor chocolate--would make Dr. Seuss Proud), Dairy Milk with Creme Egg bars, Creme Egg Fondant in a Narrow Cardboard Tube (limited edition), and of course, who could forget Creme Egg ice cream with a fondant sauce in milk chocolate? Of course, many of these variations can only be found in the United Kingdom. CS: A lot of vegans like to read Cakespy. Is there a vegan version of the Creme Egg available? CCE: While none are sold under the Cadbury imprint, vegans can make their own using the recipe posted on this site. 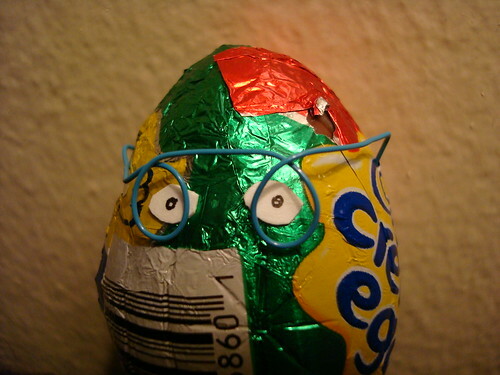 CS: How do you feel about other novelty eggs inspired by you (Russel Stover, Snickers eggs, etc)? CCE: Well, Cakespy, I could tell you that the Cadbury Creme Egg outsells every other chocolate bar during the time it's on sale each year. I could tell you that it's the number one brand in the filled egg market, with a market share of over 70% and a brand value of approximately 45 million pounds (UK). But really, isn't proof in the pudding? 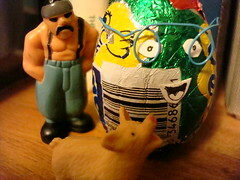 I'm the most delicious and therefore am not threatened by these inferior eggs. CS: You're all the rage between January and Easter. Where do you go the rest of the year? CCE: While I am only sold for a few months of the year, the demand does call for year-round prep and production. So while you won't see me in stores the rest of the year, I'm very much at work. CS: Finally, in the UK you have the successful "How do you eat yours?" ad campaign, whereas in the US we have that clucking bunny. What's up with that? CCE: No idea, that bunny's always freaked me out. Really, I have always identified much more with the UK campaign. CS: So...how do you eat yours? CCE: I think this interview is over (looks nervously around). CS: I think we both know how this is going to end.